There are also plaques which indicate special skills for Operators and Mechanics. The tradition of wearing the Army Driver’s Badge started back in the 1940s and can be seen on Soldiers even today. For more information about the regulation, wear and issuance of the Army Driver’s Badge check out AR 670-1 and AR 600-8-22. I totally understand not some soldiers having more interest in wearing other badges. I do believe that on formal attire, all badges a soldier has earned should be worn. That is just my opinion. Personally, I believe all skills learned that carry a job that not just anyone can perform, should come with a badge or patch. Again, this is just my opinion, but I believe these badges do give a pride to the soldiers who have earned them. I think the badge is of great value in my opinion (especially in the Reserves). The requirements may be weak, but I’m mandating that drivers conduct monthly PMCS on their assigned vehicles. In addition, having their TCs certifying that they conducted before, during, and after PMCS when we have convoy operations. Good for you, Vinh. I think the Army Driver’s Badge and Mechanic’s Badge are great. Soldiers like it and wear it with pride. Besides, I’ve never met a Soldier who turned down an award. attainment of a high degree of skill in the operation and maintenance of motor vehicles. 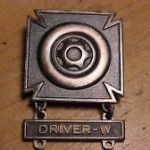 higher may approve award of the Driver and Mechanic Badge. (1) Driver—W (for wheeled vehicles). (2) Driver—T (for tracked vehicles). (4) Driver—A (for amphibious vehicles). (6) Operator—S (for special mechanical equipment). possession of sufficient previous experience as an automotive or engineer equipment mechanic to justify such a rating. automotive or engineer mechanic instructor. violation recorded on his or her DA Form 348 (Equipment Operator’s Qualification Record (Except Aircraft)). During my time as Company Commander I simply typed up the Memorandum for Record and then had my Battalion Commander sign them. It was very easy to do. Personally, I think that the Driver’s Badge has no luster in the SBCT. I never see ANY of our Soldiers with one… Not because they don’t have them but because they just choose not to wear them. Almost every single one of our Soldiers is qualified on a plethora of vehicles so its just silly to wear the badge. Besides, being Infantry Soldiers, they would must rather wear their weapon qualification badges and such. Just my take… I think it may mean something to a POGUE? Coming from a maintenance and logistics background, my guys always like wearing their Driver’s and Mechanic’s Badge, but as a tanker I can see why it isn’t a big deal to your guys. To each their own. My husband isn’t a POG and he still wants his. =) Just depends on the person, I guess.